Traditional rotary scoring machines use circular blades that are in constant motion as the stock passes through them. 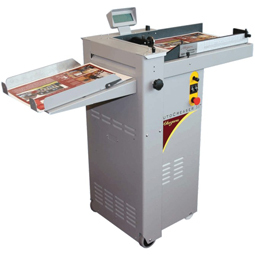 This creates a ploughing action that actually cuts through the top fibres of the paper or card in order to create a score. Inevitably this weakens the paper and encourages cracking. In contrast, the Morgana AutoCreaser Pro 33 employs a unique creasing rule and matrix as illustrated overleaf, that eliminates tearing and, therefore, cracking.